I just went to the bathroom and no one yowled to get in, no one attacked my pulled-down underwear and no one jumped in the sink waiting for me to turn on the water (‘cuz we all know running water is better than water that’s been standing in your dish). No; I had absolute privacy this time; and I cried. Hank passed away last night; sleeping in my sweater, which was where he went after checking GrammaStamper’s bathroom activities. It was as if he had a bad dream and yowled against the unseen demon … then was gone. I’ve had cats all my life. A dozen or more and GrammaStamper has had none. She asked if it’s always like this and I replied “it never gets easier”. And it never does. 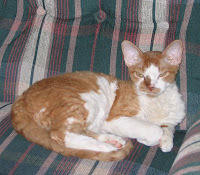 Hank was born “Cinnamon” and he told us that his moniker was ‘wussy’ so we suggested “Hank” and he approved. Hank, not Henry, was impetuous and irreverent and totally frustrating at times. He was impatient and demanding and exceptionally affectionate; to everyone, as long as you weren’t a child, dog or other unfamiliar animal. He would enter the Sear’s saleslady’s jacket and inspect any purse he was unfamiliar with, much to the chagrin of folks not accustomed to curious cats. If you didn’t like cats, he was sure to be on your shoulders trying to explain to you the benefits of felinity. Hank took on this blog when GrammaStamper had her knees replaced. He did the best he could to bring a smile to all during a difficult time. I think he did just fine even though I had clean-up chores after his party. Some might say I write this for cathartic purposes while others might say I write this for personal gratification but I write this for Hank; a fine friend and, although only a pet, worthy of a notation in our digital world. Welcome to The Stamp Shack's "Open House Around The World"
This wonderful idea is the brain-child of Jan / Far North, one of the members of The Stamp Shack. We have members from around the world and Jan thought it would be a great way to "visit" our Shackie friends over the holiday. 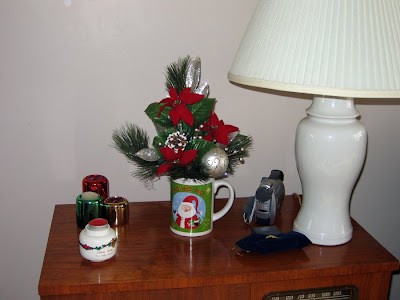 I'm with you, Jan, and would like to wish all of the visitors to my blog a Very Merry Christmas. Please leave a comment because I will be choosing a random number and that person will receive a little Christmas gift from me to say thank you for visiting. Are you ready? Then let's begin. Here we are at the entrance to our condominium suite. 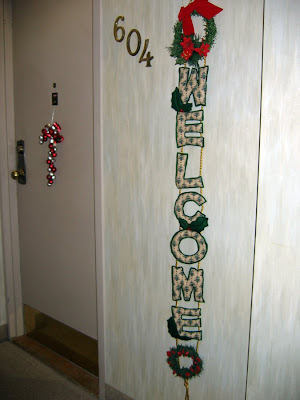 The "Welcome" decoration was purchased at a craft fair many years ago. It is fabric and rope and I just fell in love with it. If you allow your gaze to slide over to the door, you will see a whole mess of jingling bells put together in the shape of a candy cane. I like it because of the delicate jingle sounds it makes when I open the door. Once inside the door, you can see a semi-circular table that is a place to hold all sorts of things like keys, purse, mail, etc. At this time of year, I place a few Christmas ornaments on it. Let's move on into the living room. We have this antique radio that John found so many years ago I can't remember (before we even knew each other, actually) which he loving restored and stained. Here you will see more Christmas stuff. As you can see, the movie camera is at the ready for when Jackson is over and being entertaining. 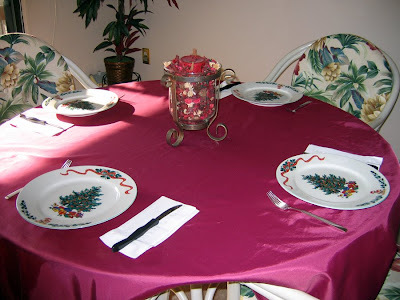 Here's a picture of our dining room table set for lunch. Andrew and his lovely wife, Sheena, will be joining us soon. 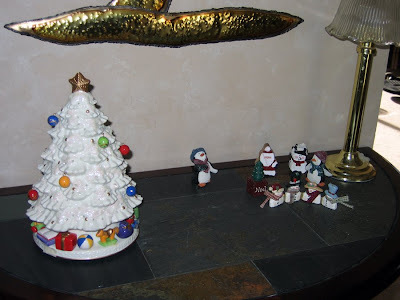 These Christmas dishes actually belong to my daughter, Tiffany, but when her sister, Kirsten, gave them to her a few years ago, Tiffany had no place to store them. I eagerly agreed to "take care" of the dishes for her. 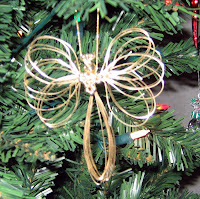 Every year since then, 2001, I think, I have enjoyed using them at this very special time of year. I'm just lucky that they haven't gone missing, or worse been broken, in all the moves across country we've had since then! 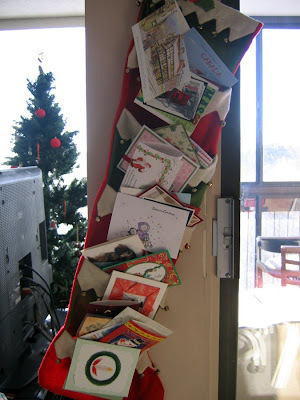 This felt Christmas stocking hangs on the wall just next to the dining table and holds all of the wonderful cards we receive each year. Almost all that are in there now are from Shackie friends. You can just see the tip of the Christmas tree in the background. Here's a better picture of our tree. I waited until evening to take the picture so that the lights would be on and twinkling. 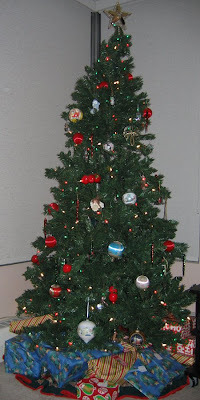 One of my favourite things about Christmas is decorating the tree. Every year as I place the ornaments on, memories come flooding back about special occasions and special people I have known and loved. Here are just a few I would like to share with you. 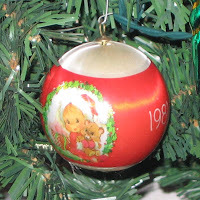 These beautiful ornaments commemorate the birth of my two sons, Andrew (1981) and Phil (1983). They celebrate "Baby's First Christmas". 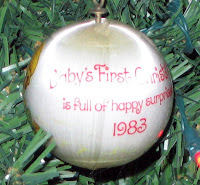 While I actually have four children, this type of ornament was not available when Tiffany and Kirsten were born or I would have four "Baby's First Christmas" decorations. Every year I feel a pang of guilt because the girls don't have their own. So I say to you young parents everywhere, start buying ornaments each year for your kids and no one will feel left out. 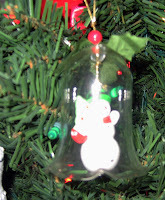 This lovely little glass bell with a snowman inside was, once upon a time, a set of six. These ornaments were sold as fundraisers at my daughters' school way back in the early '80s. I just love them and every year they remind me of my 'little' girls and how cute and sweet they were trying to sell them to relatives and friends. 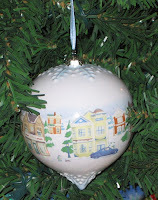 .....and last, but by no means least, is this gorgeous ornament I received from Heather/firecracker in Utah. There was an ornament swap at The Shack and Heather sent this lovely Main Street Christmas ornament. I'm pretty sure it is ceramic and is beautifully painted. It will grace our tree for many, many years to come and each year it will remind me of the generosity, kindness and goodness of our Stamp Shack members. I am truly greatful to have been given the opportunity to know such fabulous women and to be a part of such a terrific community. I would like to wish each and every person who visits my "Open House" a safe and Happy Christmas! Good night, my friends. Thank you so much for stopping by for a visit. The next stop for the Open House Around the World is hbpuppy in California. You can visit Heather by clicking here. 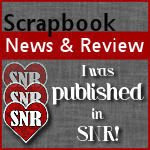 Over at The Stamp Shack, we have a section for recipes of all sorts. 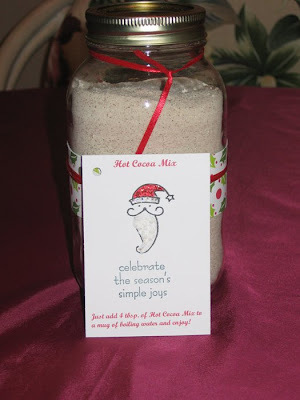 One of my good friends from there, Sherri, shared her recipe for Hot Cocoa Mix. It makes a huge amount and makes great gifts for people you really don't want to miss at Christmas. This year I finally made up a batch and here's what my end product looks like. I purchased some jars from Canadian Tire, you know the ones you use for pickles and spaghetti sauces and such. They're 1 litre in size and hold lots of the great hot cocoa mix. I cut a 1-1/2" x 12" strip of "Christmas Boughs of Holly" by American Crafts to go around the jar. Then I used my Curly Label punch set and mounted that onto some glossy green c/s and placed it on the jar because the 12" strip of paper didn't quite make it all the way around. I added some red ribbon to it and I think it looks really festive. Then, I made some tags with mixing directions and coloured Santa with Copics and added Candy Candy Stickles for bling, along with some White Perfect Puff for Santa's beard. I heated the Perfect Puff to make it look fluffy just like a real beard. 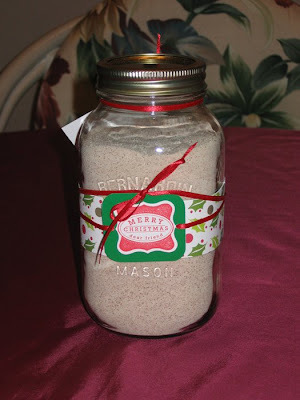 All in all, I must say I wouldn't mind giving myself one of these jars for Christmas! Today is my brother's birthday. I won't say how old he is because, quite frankly, I can't remember. All I know is loss of memory comes with age, so I'll say no more! I'm hoping to see him this afternoon or maybe he and his wife, Lesley, this evening. It's great being so close to family now. I won't miss any more birthdays (or cake)! I visited SCS this morning and the CC195 appealed to me, particularly for a man's birthday. I didn't have any Sahara Sand, so I substituted River Rock. The main image is from the Lovely As A Tree set. I stamped the upper trees in Flannel Gray by CTMH and the lower trees in Palette Hybrid Black. For a splash of colour, I added Copic G28 (Ocean Green), mixed in with some C3 (Cool Gray). I added a bit of River Rock ribbon to add a dimensional interest. 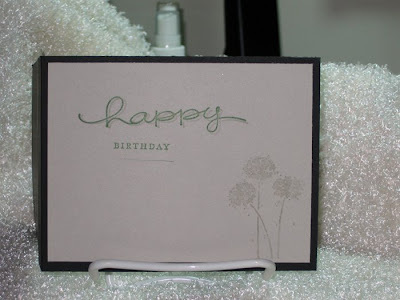 The inside of the card uses an image from Happy Harmony in the lower right, stamped in Sahara Sand and the sentiment is from Happy Everything stamped in Wild Wasabi and re-stamped, using my Stamp-A-Majig, with Flannel Gray. Overall, I like the way it turned out.